Hi guys, just to let you know, I've been super busy with work this past week or so and I'm off on holipops *this* week so there's not been much activity on the blog. I'll be back to normal next week and I'll fill you in on my first few weeks on a nail course and of course swatches, nail art and stuff. I post more frequently on twitter and instagram so follow me there to keep up to date. Another week, another Disney-themed manicure. This week I've been inspired by the fantastic Nancy of Nancy Mc Nails and her Disney Tsum Tsum nail design. She's one of the first nail artists I followed a few years ago and I'm still amazed by the level of detail in her work to this day. This is by no means as good as her manicure but I gave it a good try I'd like to think! I wanted to go for a different set of characters and I thought this would be the perfect opportunity to bring out the ol' Star Wars characters. Anyone who knows me knows I am a HUGE fan of the Stars Wars franchise. When the news broke that Disney had bought the rights to Star Wars, I had very mixed emotions but The Force Awakens got me on side. If you're not sure what Tsum Tsums are, check them out here. Basically, they're stackable plushies which feature a simplistic version of your favourite Disney characters. I hope you can guess who I've decided to put on my fingers but in case you can't, from thumb to little finger: Darth Vader, Jabba the Hut, R2-D2, Princess Leia and Bobba Fett. 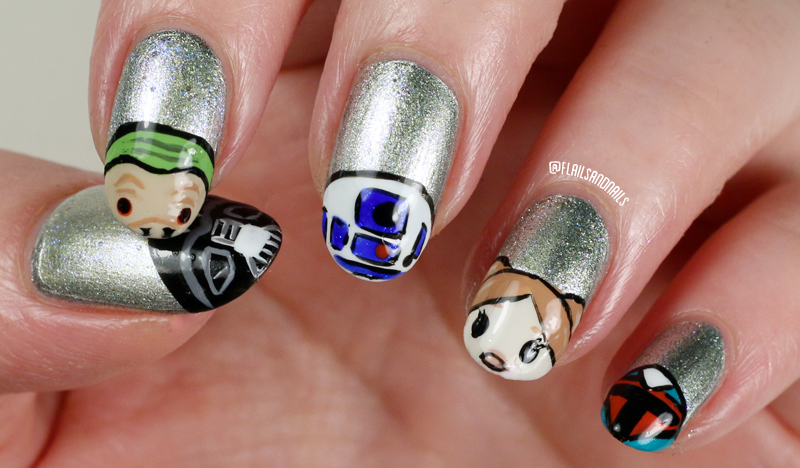 What Tsum Tsums would you put on your nails? Let me know in the comments below and be sure to like, subscribe and follow, until next time! Kiko Milano Belfast Store Opening! 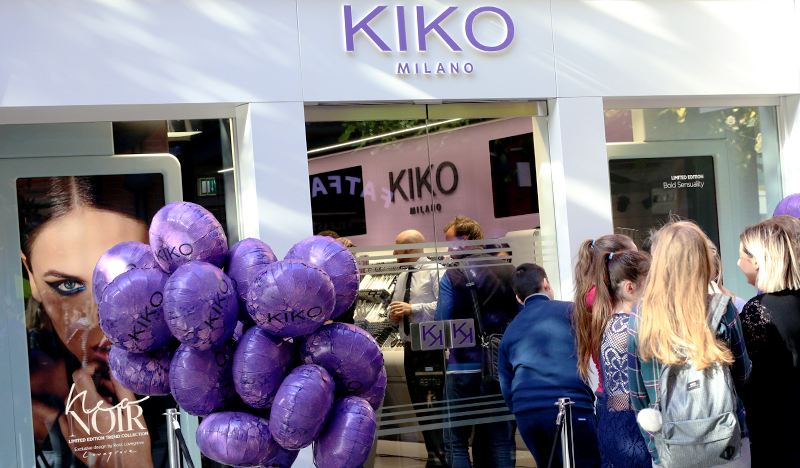 So on the 31st August, the first Kiko Milano store in Ireland opened its doors in Belfast. I was one of the lucky few who got to look around before the shop opened to the public. You guys know I love Kiko nail polishes and my posts about them are consistently my most popular so I was super excited to go check out the shop. I arrived an hour before the store opened to the public and the queue was already humongous. I salute the dedication of those first few people in the queue. 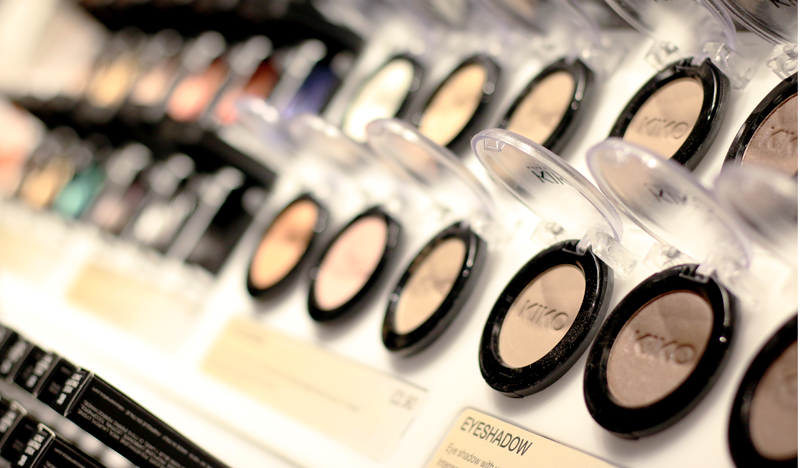 We don't have a lot of stand-alone cosmetics shops in Belfast so to have a store like Kiko open, it is a real treat for us beauty fans. If you're not familiar with Kiko Milano, it's an Italian brand which owns and manages over 800 stand-alone shops around the world. All products are made in Italy, paraben free and hypoallergenic tested. You might expect the price point of products to be quite high yeah? Oh no siree, Kiko is a high street brand, with its Smart Lipsticks and Nail Laquers starting at £2.90. Its price points would be similar to Max Factor or L'Oreal. 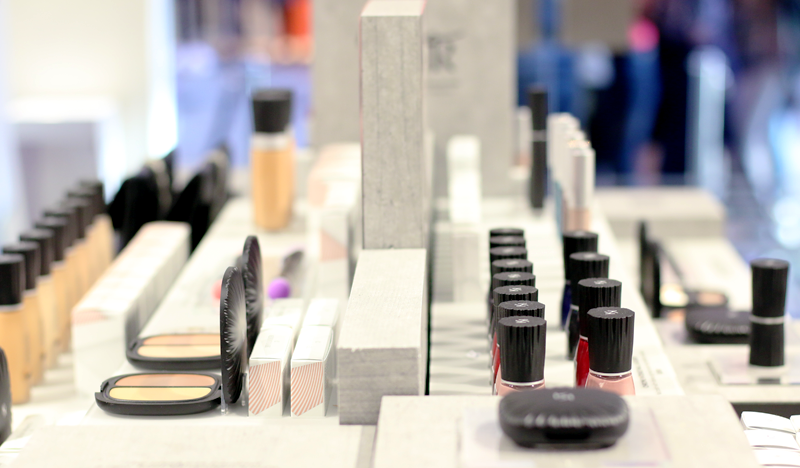 This picture is from the front table of the store which will permanently host the brand's limited edition collections which are released four times a year. This is Neo Noir, their Autumn/Winter collection. I mean, is anyone else salivating over this? 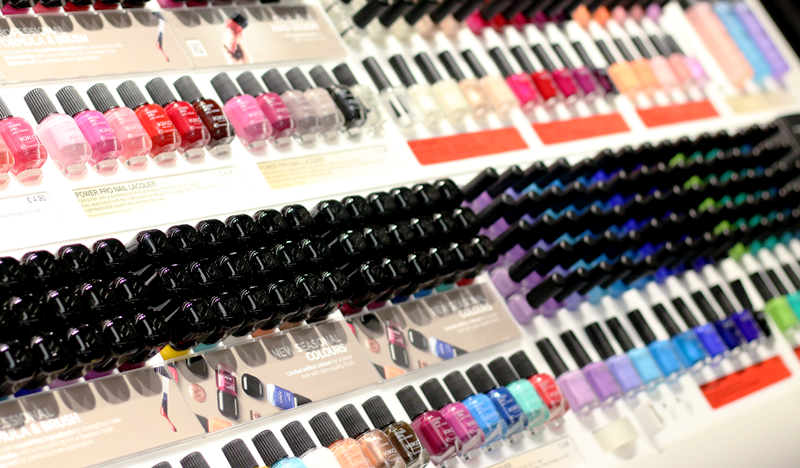 They have an extensive range of polishes and you can even swatch them with the nifty cellotape dispenser which is a part of the display. If you're not into polishes as much as I am then you'll fall in love with the rows and rows of lipsticks, eyeshadows, foundations and everything inbetween. 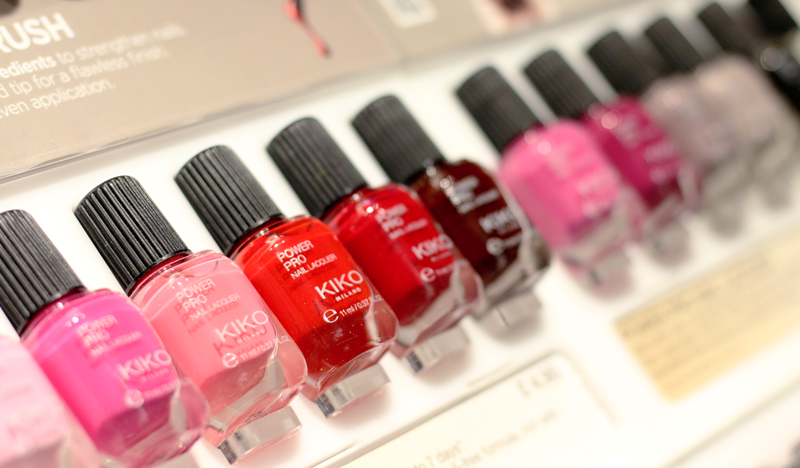 As part of the Kiko experience, you can have complementary application. Complementary means complementary, no hidden charges or fees. If you want to try something, you can. There are testers for EVERY product so you can either try it on yourself or ask one of the trained staff to help you out. 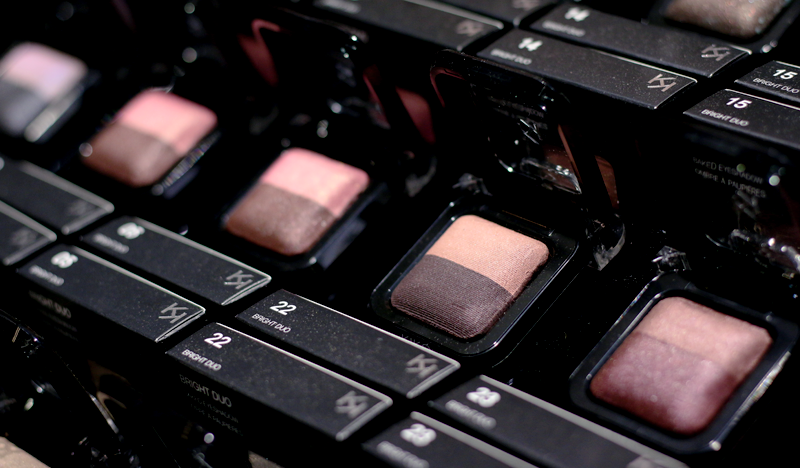 The staff I was chatting to in store were lovely and approachable, nothing like certain other make-up brands. Lo and behold we were let loose on the store and were told we had a gift voucher to go towards purchases. I went a bit crazy and spent the voucher and a lot more but I picked up some gorgeous things. I made sure to focus more on general make-up items than nail polishes since I know I love Kiko Milano's polishes. I was going to post my purchases as well but I filmed the unboxing and it didn't turn out great so that might come a later date but check out my INSTAGRAM for a picture of it all. If you're around Belfast then check out the new store, it's on William Street South, between Hotel Chocolat and Argos. To sum it up I'd say the shop gives you MAC counter vibes for the sheer beauty and awesome displays of products but a far more welcoming atmosphere.